Herb and garlic cheese spread is another old recipe I found in my binder from my early days of learning how to cook. I remember Aaron loved it back then, so when I saw this I thought it would make a good snack for him to bring in for lunch! It’s funny because the day I made this, he came home from the gym starving and wanting something to eat, and I was just getting ready to photograph this. I turned my back to grab some props to stage and turned around and there he was, digging into my perfectly coiffed globe of herb and garlic cheese spread. I had to smack his hands away and re-do the coif. I don’t even know if it’s called a coif. Not even sure where I got that from. But I had to re-swirl it again and make it pretty. Food bloggers will know what I mean. I snapped this little behind-the-scenes of shooting this recipe. The mid-day lighting is so amazing in this window. If I wait too long into the afternoon, the setting sun will shine right into this window and cast shadows. So I try to get my cooking done earlier in the day on weekends if I’m photographing a recipe! 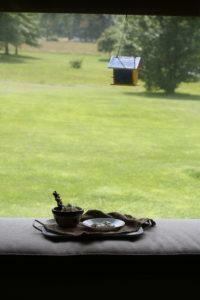 This is a huuuge bay window that looks out onto about half of my three acres. It’s part of what sold us on this house. And for Christmas last year, my mom got a custom-made window seat cushion for this window. It’s so awesome. My daughter sometimes sits up there and reads. Anyway. 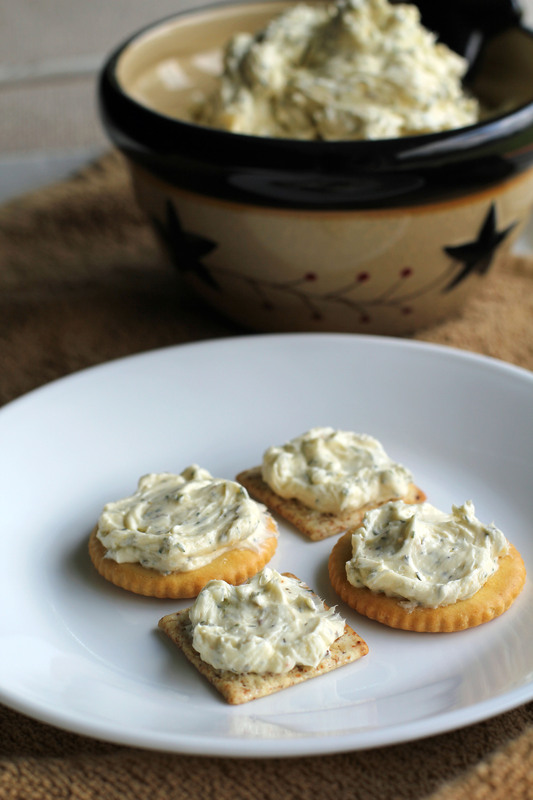 This herb and garlic cheese spread is a great dip to have out at your next party! It’s highly addictive, hubby couldn’t stop eating it until I reminded him it’s mostly for his lunch… then he finally put the crackers away. Add all ingredients to a bowl and use beaters to beat together and combine well. Cover and refrigerate at least 2 hours and up to one week.